Compare prices on car hire in Bergen Airport from all the major brands and find the best deals. When you book through us, unlimited mileage and insurance are always included in the price given. Bergen Airport Flesland (BGO) is located at the airport 20 km south of Bergen .The airport bus between the airport and Bergen every 15 minute of every day and takes approximately 30 minutes. There is also a boat from the airport. The car rental companies represented at the airport are Hertz, Europcar, National, Budget and Avis. Bergen Airport Flesland has been voted Europe’s best airport and the world’s 6 best airport of the British travel magazine Wanderlust Travel Awards. With 4,808,419 passengers in 2008, Bergen Airport, the second largest in Norway .There are direct flights to 23 different international destinations from the airport. The main destination is Oslo with many routing connections round trip daily.It has been decided that the airport will be upgraded. 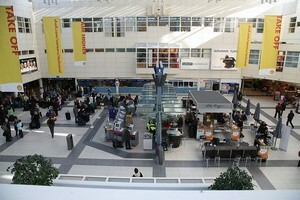 Bergen Airport has 7 different restaurants, duty-free and some stores. It has wireless internet, banking and meeting rooms. In April 2007 opened the first airport hotel, the Clarion Hotel Bergen Airport, with room for 650 people.